Yesterday I had the courage to "dismantle" the Order .. Calm !! She was already with the centerpiece "loose" .. I removed very carefully not to break. And These are the photos of the "dismantle". I have a question regarding Officer's Class awards and ribbons. 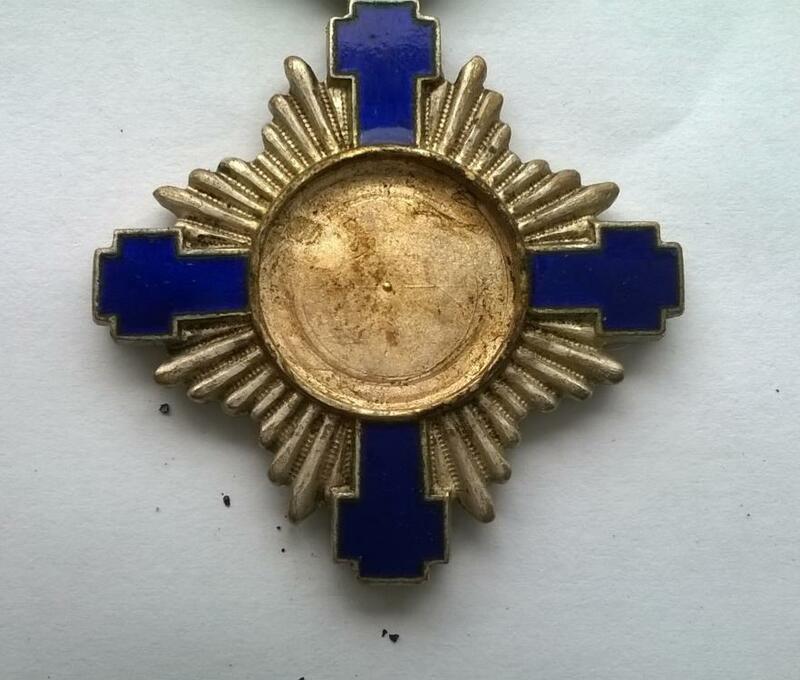 Suppose the photo showing the 4 silver Knight's Cross of Order of the Star were actually 4 gilded Officer's Cross of Order of the Star. I assume the first 2 awards (leftmost) would have rosette's on the ribbon. However, in regards to the two remaining (rightmost) award, would they have a rosette since they are on war ribbons?? I am most concerned about award #4 (red-blue ribbon) since it is a Battlefield ribbon. I remember reading somewhere that when a 4th Class (Officer's Class) Bulgarian Military Merit Award is suspended from the light blue with silver stripes (wartime or bravery ribbon) that the wartime/bravery ribbon does not have a rosette. I wondered if this applies to Romanian awards hung from either the wartime or battlefield ribbons. Romanian orders in Officer class always had the rosette, irrespective of being peacetime or wartime awards. 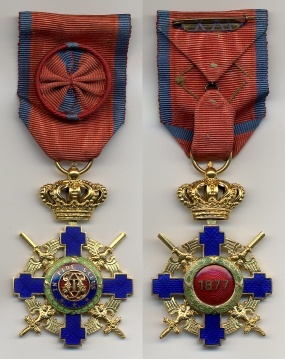 Please see below an Officer's Cross of the Order of the Star of Romania with Swords on Military Virtue ribbon with the corresponding rosette. Thanks a lot Carol. I thought I remembered seeing some rosettes on the military virtue (wartime) ribbon (as you posted). 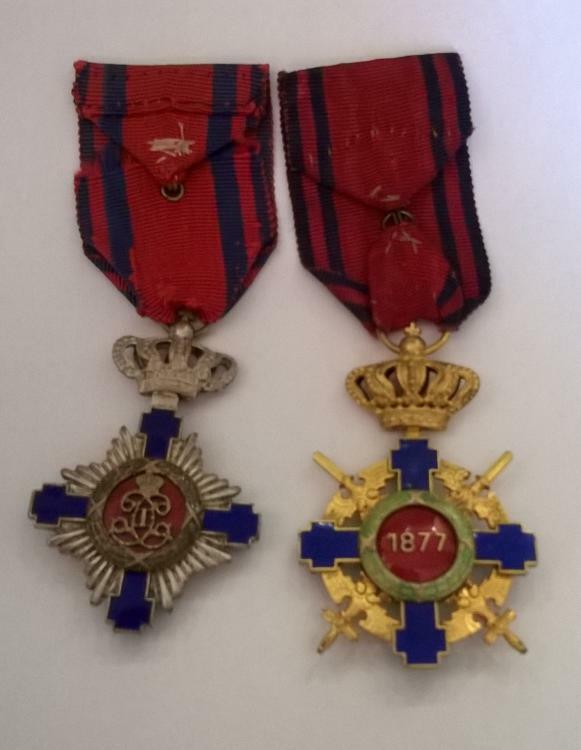 I have an Officer's Class Order of the Star award (just like the one in the photo that you posted) except mine is on the peacetime ribbon (red with silver stripes) and it has a rosette. 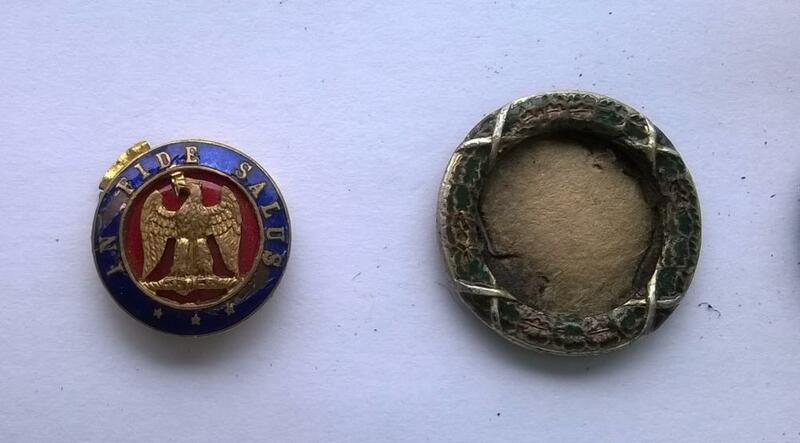 However, I have an Order of the Crown (Type 2 or WW2 variety) and it is on an incorrect ribbon. It is on the peacetime ribbon with rosette for Type 1 (WW1) Order of the Crown, instead of the peacetime ribbon for Type 2 (WW2) Order of the Crown. I have found and bought two types of replacement ribbons for this award--a wartime (non-battlefield) ribbon with gold edges and the military virtue or battlefield ribbon (red with blue edges). However, since both of these ribbons require rosettes when they are used with an Officer's Class medal, I need to find a rosette for at least one of these 2 ribbons. Anybody have any rosettes for sale? I am not quite sure what award you have and what ribbon you are looking for. You first mention that the award should have the peacetime ribbon, but then you say that you have two wartime ribbons for which you are looking for rosettes. You also seem to refer to Type II and WWII interchangeably, but this is in fact not the case as Type II awards were in use between 1932 and 1947, while WWII lasted from 1941 (for Romania at least) to 1945. Please note that for the Order of the Crown you have a similar layout as for the Order of the Star I illustrated earlier, with civilian insignia, peacetime military insignia and wartime insignia. I'm aware that Type 2 awards were issued between 1932 and 1947. WW2 is a subset of this period. This redundancy was included so people who were not familiar with Type 1 and Type 2 awards would understand that Type 1 awards were issued during WW1 and Type 2 awards were issued during WW2. I do apologize for any confusion this may have caused. I never said my Order of the Crown award "should have the peacetime ribbon". That is an assumption that you made. I said my Type 2 Order of the Crown came with the wrong ribbon, which was a Type 1 Peacetime ribbon (complete with rosette). 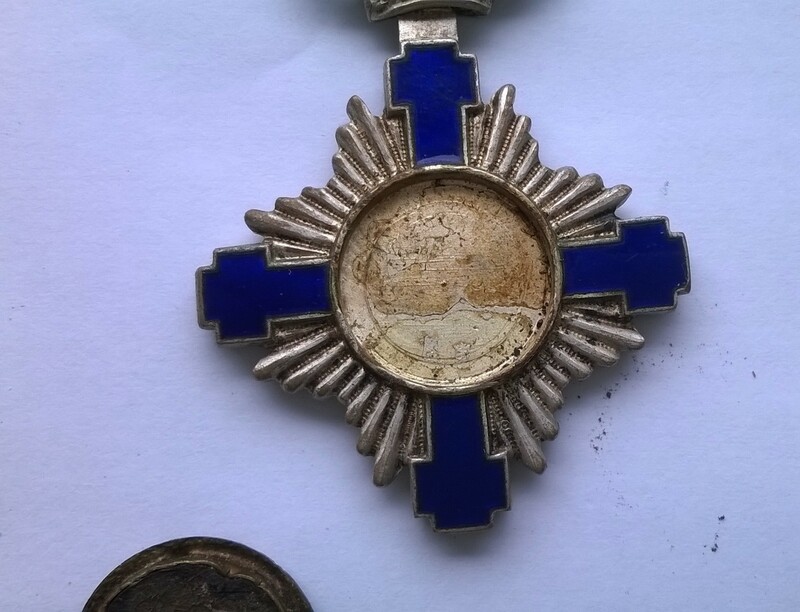 In fact, the dealer who sold me this Type 2 Order of the Crown is notorious for buying naked medals and dressing them up with the closest ribbon that is readily available to him, which in this case was a Type 1 Romanian Order of the Crown ribbon with rosette. Since there is a very good chance that the person (likely the dealer) who put this improper Type 1 peacetime ribbon on my award had no idea whether the original ribbon was a Type 2 peacetime ribbon, a Type 2 1938 Wartime ribbon, or a red-blue battlefield (Military Virture) ribbon, it is improper to make the assumption that this is a peacetime award and that I must replace it with Type 2 peacetime ribbon. What if this award came with black and white WW1-era iron cross ribbon? It wouldn't mean I would have to replace it with black, white, and red WW2-era iron cross ribbon. while WWII lasted from 1941 (for Romania at least) to 1945. Actually, Romania signed the Tripartite Pact on November 23,1940 so one could argue that they became involved in WW2 in 1940 although they didn't join the invasion of the Soviet Union until June 1941. 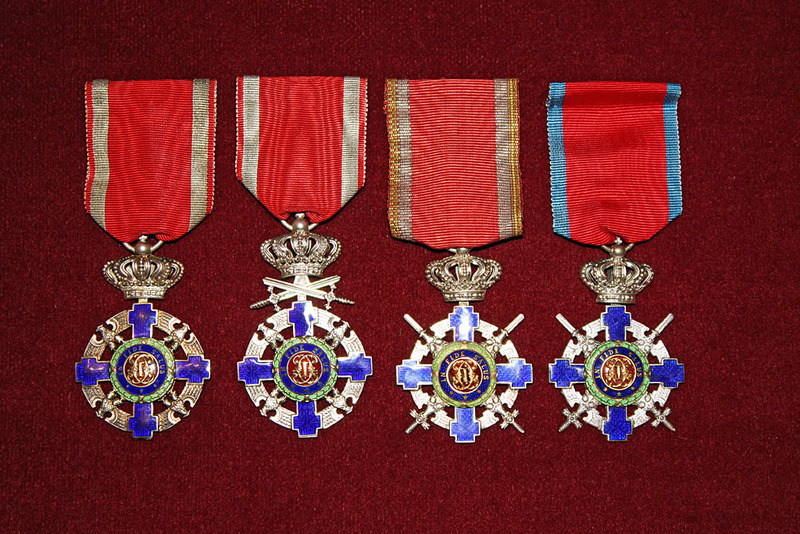 I never said my Order of the Crown award "should have the peacetime ribbon". That is an assumption that you made. However, I have an Order of the Crown (Type 2 or WW2 variety) and it is on an incorrect ribbon. 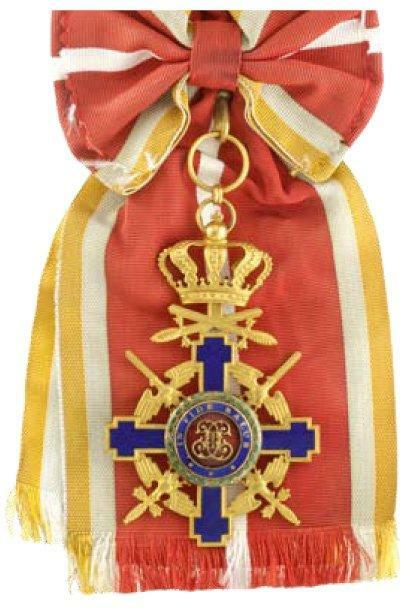 It is on the peacetime ribbon with rosette for Type 1 (WW1) Order of the Crown, instead of the peacetime ribbon for Type 2 (WW2) Order of the Crown. I understand now that you must have the wartime insignia with swords through the centre of the cross. In fact, the dealer who sold me this Type 2 Order of the Crown is notorious for buying naked medals and dressing them up with the closest ribbon that is readily available to him, which in this case was a Type 1 Romanian Order of the Crown ribbon with rosette. Since there is a very good chance that the person (likely the dealer) who put this improper Type 1 peacetime ribbon on my award had no idea whether the original ribbon was a Type 2 peacetime ribbon, a Type 2 1938 Wartime ribbon, or a red-blue battlefield (Military Virture) ribbon, it is improper to make the assumption that this is a peacetime award and that I must replace it with Type 2 peacetime ribbon. What if this award came with black and white WW1-era iron cross ribbon? It wouldn't mean I would have to replace it with black, white, and red WW2-era iron cross ribbon. Some dealer practices are indeed questionable, to say the least, and one should strive to restore the award to its original condition, including matching the ribbon with the award. If I can find a Type 2 peacetime ribbon complete with a matching rosette, I'll gladly use that ribbon instead of the other two ribbons that I have already purchased. This puzzles me again. I do not understand how using a peacetime ribbon for a wartime insignia would be better than using the existing ribbon. Both are wrong ribbons for the wartime insignia. This being said, I wish you good luck to your search for the proper wartime insignia. One solution would be to look for crosses in very poor condition, but with the right ribbon. One could argue that Romania did get involved much earlier when it allowed the passage of the Polish treasury and elements of the Polish army, but I was referring to the issuance of declarations of war in 1941. I now see where this exchange went sour and I will take the blame for it all. 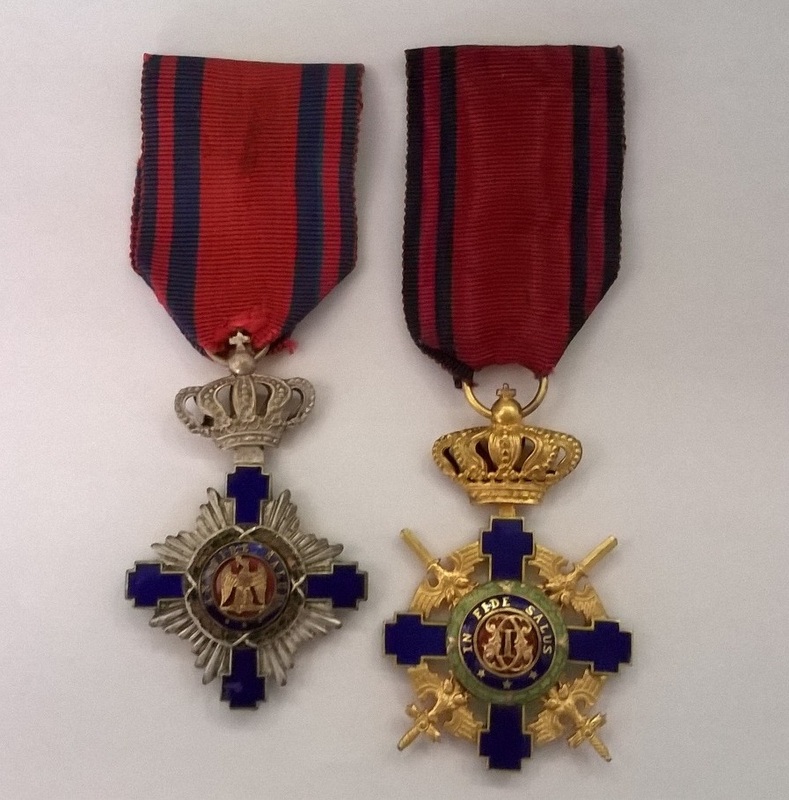 When I wrote "It is on the peacetime ribbon with rosette for Type 1 (WW1) Order of the Crown, instead of the peacetime ribbon for Type 2 (WW2) Order of the Crown", I should have never wrote the 2nd "peacetime". It was a typo that I never caught until you pointed it out. When I wrote the paragraph that contained the above sentence, I was trying to give a brief (yet totally unnecessary) explanation as to why I asked my original question. Thus when I wrote my last comment, I must admit that I was a bit miffed because It never dawned on me that such an afterthought would draw so much criticism or I would have drafted a more careful explanation. However, now that I understand your point of view, I was wrong to view your comments as a personal attack and I apologize for being so defensive. So what should we do with the awards that are being sold without ribbons? Let them go forever ribbonless or try and find them a proper replacement ribbon even if we aren't sure that the replacement ribbon is the original ribbon? I've heard of crooked dealers and collectors who intentionally put non-combat ribbons on combat awards (and vice-versa) in order to sell them for a lot more money. This is especially common if the same ribbon is used for more than one award. In this particular case, they remove vintage ribbons from the cheaper awards and put them on more expensive, yet naked, awards. Thus, I think it is naive to think that just because a medal comes with a vintage ribbon this means that it is the original ribbon unless the award comes with a certificate of authenticity. As these awards continue to changed hands, this degree of uncertainty will only increase as time progresses. No problem, David, with the misunderstanding. I agree that authenticity could be hard to prove in many cases and for that very reason one needs to continuously study collection pieces to observe and compare details and weed out doubtful pieces or combinations. Regarding restoration, some parts could indeed be hard to find and I would advise a correct replacement ribbon to a period, but wrong one. Good luck with your search. Thanks for your understanding! I really appreciate your helpful comments. Patience is a virtue when it comes to looking for the proper medal and ribbon. I positively love the Romanian Order of the Star and have several versions of it. I think it has a most distinctive design with its starburst/sunburst pattern. Here is some research I have done on the passing art of old enameling for the benefit of others (and myself). When done correctly, the Model 1 exhibited exquisite and complicated enameling of a number of colors in intricate detail and finesse. Excerpted and crediting the book on Enamels by the Smithsonian Illustrated Library of Antiques and prepared by the Cooper-Hewitt Museum. Distilled. Enameling is an outstanding example of human skill and is a refined and sophisticated technique. It has been a craft patronized by the wealthy and for discerning collectors. The jewel-like brilliance of its vitreous surface is durable and the colors in which it can be produced range from the bold and vivid to the subtle and pastel. The particular technical problems inherent in the enameling process with its need for successive firings and the fact that colors change during firing at different temperatures make the production of a really fine enameled piece something to be marveled it. Enamellers have rivaled if not surpassed the work of the finest jewelers. Enameling is an unpredictable art and a combination of intuition and science that demands perception as well as skill for a successful conclusion. Enamel is a vitreous glass glaze that is fused to a metal base. The chemical constituents are silica (sand), borates, alkalis (soda and potash), alkalines (lime, magnesia, lead) and oxides of metals for coloring. There are four4 basic types: opaque, opalescent, translucent and transparent. Production methods include: cloisonné, champlevé (raised field), basse-taille (shallow cut), guilloche (engine-turned), Plique a jour, also known as email de plique. There is also filigree and skan enameling as well as en plain (on an open field). Blue enamel is produced by cobalt. Carbonate of copper produces green, manganese produces purple, oxide of gold produces some pinks and reds. The color is affected by the constitution of the molten glass (flux) and by the type or quantity of the oxide. The majority of enamel colors cannot be mixed to give an intermediate shade. Most of them must be prepared with their own specific oxide. 1. 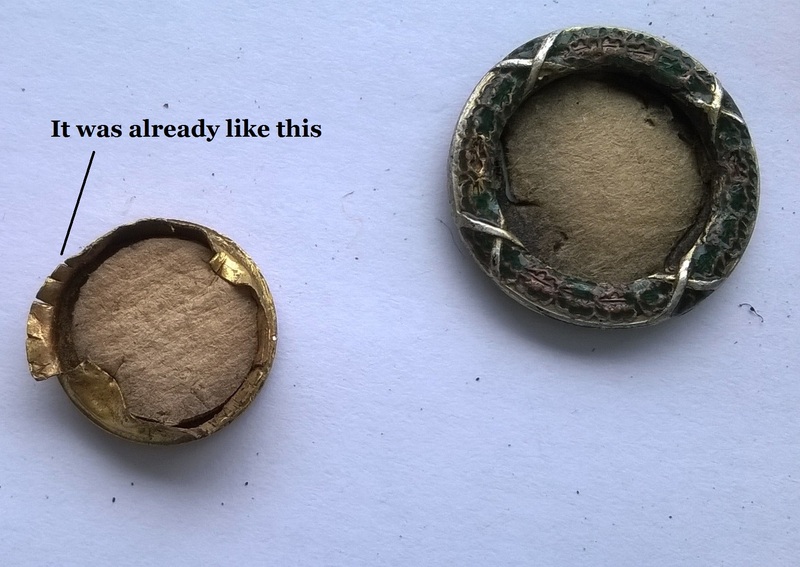 The article the enamel is applied to is washed and plunged into a diluted acid to etch the surface in order to give a good key (allover roughness) to which the enamel can adhere. The piece is washed again. 2. Raw enamel is pulverized with water until it is reduced to a fine power. The powder is washed multiple times in distilled water. It is dried and sifted through a fine sieve. 3. It is applied to metal either in powdered form mixed with water and gum tragacanth or by brush or palette knife in which case it must first be mixed with a volatile oil such as spike (lavender) oil or oil of sassafras. 4. Several layers are required to form a cover and each must be dried thoroughly then fired before the next is applied. Firing takes place in a kiln or furnace at temperatures between 600 and 850 degrees Centigrade (or 1110 to 1562 Fahrenheit). Intense white heat is essential to achieve the temperature at which enamel will fuse to metal. Firing takes only a few minutes. 5. Rapid cooling would have a detrimental effect, creating a brittle enamel that could easily crack or scale. 6. Different colors are fired at varying temperatures, those that can withstand the greatest heat, such as brown, blue and green, being fired first. There are multiple applications and firings. In the case of painted enamels, up to 20 firings may be needed. Each time an object is fired, great care must be taken to protect already used colors from damage caused by overfiring. Many articles also are coated on both sides. Once the metal is enclosed between two layers of enamel, the combined substances react simultaneously, another difficult task. 7. The enamel is filed down with carborundum until smooth, fired then polished with the finest pumice powder. Excerpted from the book, Enameling for Beginners by Edward Winter. Distilled. Raw materials for opaque white enamels will melt into liquid glass in from three and a half to four hours, smelting at 2,300 degrees F. By changing the proportions of the ingredients, the opacity or transparency, hardness or softness of enamel is determined. These ingredients are: silica, arsenic oxide, potassium carbonate, borax and lead oxide. (Feldspar is also an ingredient). Focused flames are directed onto the enamel to keep it flowing freely. The molten enamel can be poured into tanks of water to break it up into small particles called frit. Lumps of frit can be crushed into powder that will pass through an 80 or 100 mesh sieve. The powder is then shaken through a sieve onto a platform. Enamel is wet ground in a ball mill. A typical mixture for a small size mill would be 100 parts frit, six parts of clear clay, a fourth part of potassium carbonate and 40 cubic centimeters (about a cup) of water. The produces a slip or slush enamel. When grinding is completed, the enamel is dumped, along with the porcelain grinding balls, into a large 200 mesh sieve resting on a basin. The slush enamel is then shaken through the sieve into the basin. Chromel steel tongs and fork can be used for placing enamel pieces in and out of the furnace. Chromel steel trivets, fire-clay stilts and chromel wire screens support enamel pieces for firing. Enamels of unusual shape need specially designed trivets to hold them successfully. Gum tragacanth, a whitish vegetable gum derived from sea plants, is applied in solution form to metal surfaces to bind the dry, sifted enamel upon them before firing. The flakes should be dissolved by boiling in a basin of water. The resultant solution which should have a watery consistency, is applied with a camel’s hair brush. A few drops of alcohol will keep it from fermenting. Vitreous enamel is the producing of the melting together of the correct proportion of materials in a smelter that reaches a temperature of about 2,100 degrees F.
A complete book could be written about the science of producing colors and the great assortment of subtle tones and shades which are crafted. With most manufacturers, these formulae are guarded secrets and handed down. Color is given to the glass enamels by the addition of certain metallic oxides before the raw material batch is smelted and during this melting process the colored enamel is made. Liquid slush or enamel slip colors are processed differently, since colorants and oxides are added to the clear enamel frit by the manufacturer and ground up with the addition of prescribed proportions of water, fine clay and chemical salts in the porcelain ball mill. Enamels for steel, copper and silver are similar in so far as firing temperature is concerned, fusing after two to three minutes at 1,450 to 1,500 degrees F.
Excerpted from the book, Metalwork & Enameling by Herbert Maryon. Distilled. Enamel should not be exposed to the direct blast of the flame or it may be discolored. 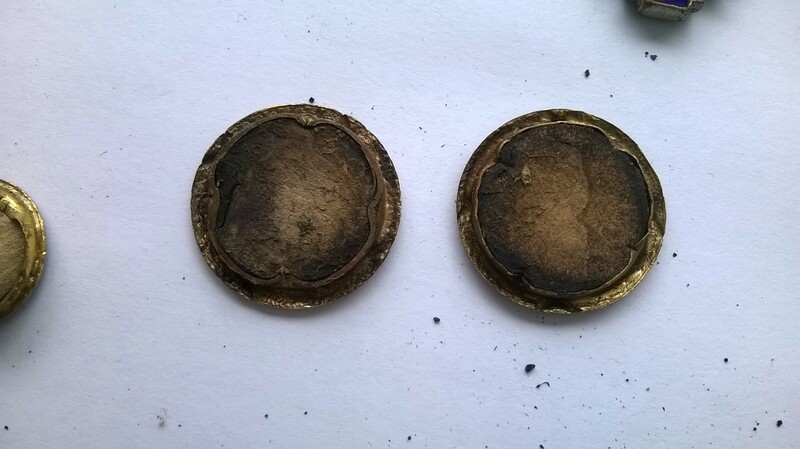 The method is dangerous for firing small silver articles, they melt so easily. Iron scales or rust will discolor clear glass flux or frit, so the enamel must be protected against any accidental flaking of the iron support on which it is fired. All colors must be ground equally find and the heat of furnace needs to reach them all to the same (amount of coverage). In bassetaille enamel, the metal groundplate is chased or sometimes engraved in such a way that its modeled surfaces beneath the enamel form an essential part of the design. Undulating surfaces are visible through the enamel that covers them and take an important share in producing the final effect. 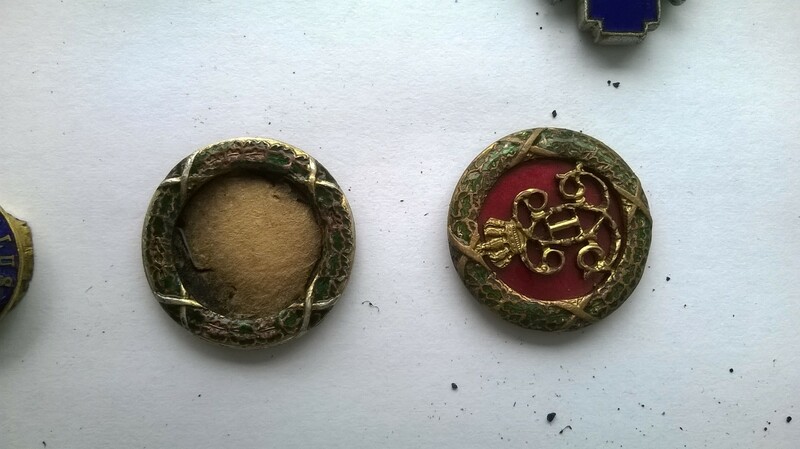 If some wet, powdered enamel is to be laid down beside another patch which is still wet, care must be taken that the boundary line between them does not become irregular. The most convenient way to prevent this is to add a little gum tragacanth to each batch of enamel and to allow the first colors to dry before the next are laid alongside them. They will not then spread much on to their neighbor’s territory. In a bassetaille enamel, because so much of its effect depends upon the modeling of the metal beneath it, the enamel itself must have a level and well-polished surface. All depressions in the enameled surface should be filled up and refired and the surface ground level and polished. Any soldered joints must be protected by painting them with rouge or whiting. For more elaborate work, it is sometimes necessary to provide a support made from plaster of Paris. The plaster is made to envelop large portions of the work, leaving exposed only those parts on which the enamel is to come. When all the soldering and cleaning up has been finished and the work is ready for the enameling, it is set up on an iron furnace plate. Plaster of Paris is mixed in a spoon and spread over the work with a spatula. Every part may be covered with plaster except those surfaces which are to be enameled. The work may be fired again and again if necessary, but at no time must a soldered joint be left unprotected. just to make things more complicated - there is a 5th version of the order (both first and second type)- given to foreign dignitaries only. It has both type of swords - war and merit (on the cross and above the cross). For the first type, I have a cavalier only, while for the second type, I have cavalier but I've seen it up to the Grand Officer. It seems that the ribbon is of the war type, with a silver/white stripe added to the middle (second type). This one was sold at auction without badge. This model (both the badge and the ribbon) was not described in any official regulation and therefore I regard them as fantasy pieces made to deceive the collectors. Rudolf Souval and/or post-Souval Kai Meyer shops may have manufactued these swords on ring and swords thru center plus extra white stripe ribbon variations, likely post-WW II. Meyer certainly sold them in the 1960's. Carol I's analysis appears to be on point. Other GMIC threads discuss non-statutory Bulgarian St. Alexander swords on ring and swords thru center pieces. Thoughts on these St. Alexanders range from complete fantasies designed for 'advanced collectors [read suckers]' to 'special models' made at request of foreign officers unfamiliar with Bulgarian regulations to unrealized makers' projects to baubbles used for self-promotion via obscure foreign bling. Seem to recall that someone, maybe Charles Pankey, described these Romanian oddities in an OMSA or similar organization article with illustrations from Meyer. 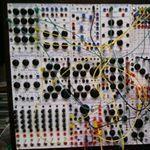 I am travelling but will look thru Meyer material late next week with hopes of finding more info. 922F, just a quick remark, Kai Meyer made restrikes of several Danish medals (mostly with original dies which he borrowed from the Mint, still they differs from the originals), but never foreign Orders, but he may very well have sold them as with other items (3rd Reich stuff) he bought from for example Souval.